It’s been a while since I’ve written here. The first half of 2014 was pretty full on finishing design & proofs for my book, then its launch and aftermath. Home and garden deserved and needed some proper attention. So writing took a back seat from the summer onwards. My return was a tad delayed when I discovered that the pictures from the old Blogspot predecessor to this blog had disappeared into internet hell. So I’ve spent the last 3 days resurrecting the pictures from various computer hidey holes. In a change from the ‘normal’ diet of food for your tastebuds, I have some recommendations for aural nutrition via earbuds. I’ve been a podcast listener since the early noughties, starting with the brilliant Naked Scientists science podcast. 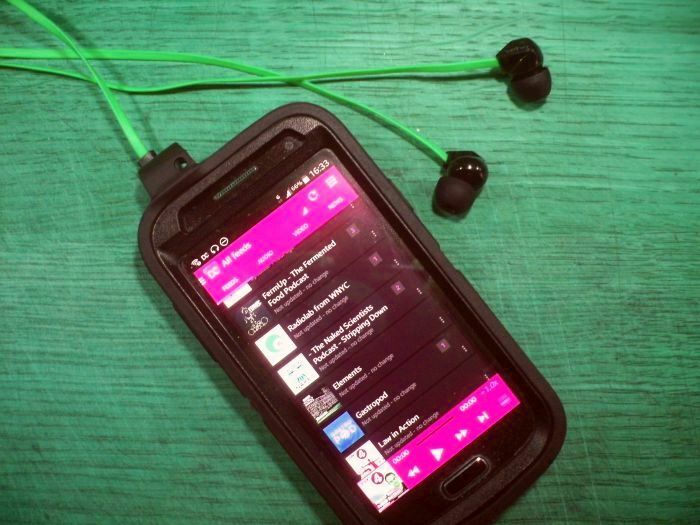 Podcasts are syndicated audio programmes you can listen to online or download to your smartphone or tablet. They’ve had quite a bit of news coverage recently due to the success of the US podcast Serial which has gathered a cult following. I like podcasts because I can listen to them when I want and when I have time. They’re ideal for work commutes, lie-ins and while I’m cooking. I want to recommend two food related podcasts to you that I think are packed full of interesting and useful information and really well produced. Each episode, we look at the hidden history and surprising science behind a different food and/or farming-related topic, from aquaculture to ancient feasts, from cutlery to chile peppers, and from microbes to Malbec. I was hooked from the first fascinating programme on the science & history of cutlery. 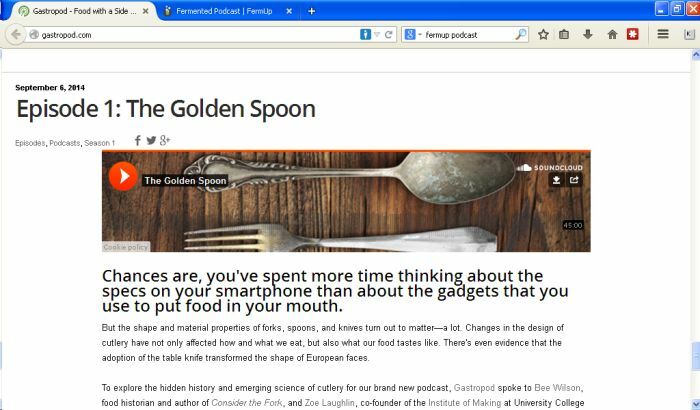 Do you know how the material of a spoon affects how food tastes? When were forks first commonly used? How was the microplane grater discovered/invented? Last month there was a great show about ‘The new Kale’: seaweed farming from the USA to Scotland and beyond. Each programme has extensive show notes for you to delve into should you fancy to find out more about the subject and the people interviewed. The podcast comes out about every couple of weeks. The presenters’ style is very approachable with lightness and humour folded in with the analysis and facts. Cynthia and Nicola are just preparing material for their second series, so catch up with the delights of the first. 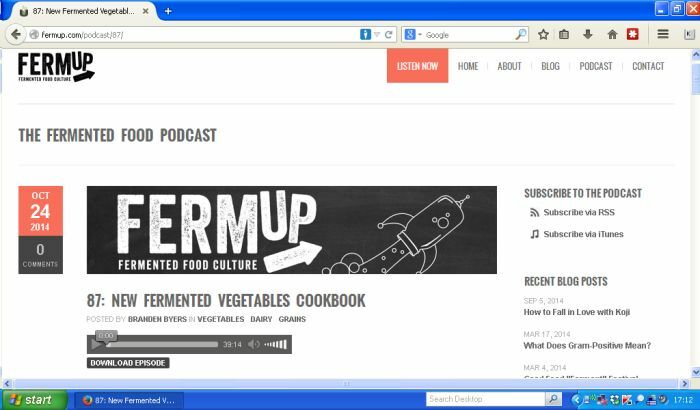 This is a great podcast about all things fermented. Kefir, kombucha, cheese, krauts, yoghurt etc etc. It’s hosted by home DIYer Brandon Byers and food scientist Allison Wells. It’s roughly weekly with an interview with a special guest or guests. The guests include fermentation experts, scientists, fellow DIYers, authors and any other interesting fermenter. If you’re into fermenting in any of its forms you’ll find this interesting. One that particularly caught my attention was an excellent interview with Kirsten and Chris Shockey, co-authors of Fermented Vegetables. It’s an excellent book (I’ll review it properly later). Kirsten and Chris give insights about writing the book, how they got into and out of business and how fermentation fits into their life. It’s an inspiring listen. The podcast has delved into ancient dairy ferments with a textile historian (really), black garlic, kombucha kits, fermented weeds and much more. As with Gastropod, there are extensive show notes to allow you to follow up on things you find especially interesting. Have a listen to hear what’s bubbling up. What food-related podcasts can you recommend to me?